Harper's Weekly | August 28, 1909, pp. 22-23. It wrapped my skirts about the iron gear of the coach as I climbed to the seat beside the driver, and, as we dropped the town behind us, lifted my hat and searched out my hairpins. But it was the desert wind and the smell it carried was the smell of marrow-fat weed and gilias after the sun goes down; so, because I had been very unhappy away from it, and was now drunk with the joy of renewal, and as in my case there would be no time for a toilet proper to the road until we came to the Eighteen-Mile House, I was satisfied merely to cling to the pitching front of the coach and let the wind do what it would. The sky was alight and saffron-tinted, the mountains bloomed with violet shadows; as we came whirling by the point of Dead-Man we saw the wickiups of the Paiutes, and the little hearth fires all awink among the sage. They had a look of home. "It was out there," he said, waving his whip toward the gulf of blackness, "when I was doin' assessment work for McKenna, nigh to the end of nowhere, I ... took up with an Indian woman." He hurried past this admission with intent to cover it from possible reproach, telling how McKenna had dumped him with three months' grub by a water-hole called Agua Dulce, distant a mile or two from the claims he was expected to work. "Because," he said, "it was cheaper than packin' water, me bein' alone, and McKenna, for some reason I never rightly guessed, keen to keep the business on the quiet. McKenna would be visitin' me once a month or so, and I 'lowed I wouldn't be lonesome much," he laughed, "and I didn't after I ... took up with Catameneda. "Seems like white women can't get to understand why a man takes up with a mahala. They think it's just badness and so they're down on it ... maybe it is with some ... but not when they are like ... like me ... and Catameneda. ... There's something away down in a man that his own womenfolks never understand ... an' you spend all your life trying to keep them from understanding ... though when there's one that does she plays hell with you. ... It ain't badness. ... I don't know rightly what, only it ain't all bad ... but Catameneda ... she understood ... and I was glad to have her." "You know how it is with these desert tribes," said the stage-driver, "every camp looks as if it might have been there for a hundred years, and when they go there's no more left than a last year's bird-nest. They just scramble up out of nothing and melt away in the sand like a horned toad. But they was friendly ... sort of ... when you got to know them ... and the men talked English considerable. ... Evenings, when a kind of creepy chill comes on, they get around their little fires and crack their jokes ... good jokes, too ... there was one old buck real comical ... he used to explain them in English afterward. And when they sang their songs ... when the fires were lit and the voices came out of the dark, and you couldn't see the dirt nor the color of their skins, you would sort of forget they wasn't your own folks. "And so," he said after a longer silence, "when the camp went on another pasear ... Catameneda ... she stayed." That was all I was ever to know of that phase of it. "Catameneda … stayed." That and the flicker in his voice cast up from the things in him that only the Indian woman could understand, that lit the situation through his scanty speech like the glow of those vanished fires. ... "It was a sort of pretty place at Agua Dulce," said he. "The spring came out from the black rock into a basin with a gurgly sound. There was a pink flowering bush behind it and a smitch of green where it ran over into the sand ... and the rest was sage-brush, little and low; and crumply, colored hills. There were doves came and built in the flowering shrubs, for they hadn't no fear of man ... and 'Maneda, she fed them." By this time I knew the story had come to some uncommon end that lifted it beyond the vulgar adventure of satiety and desertion, for there was no yellowness in the boy that he should blab upon the tenderness of women. There was a good hour yet until we came to Coyote Holes, and I meant to have it all out of him by then. The end had come very quickly. It began in their growing careless through happiness and neglecting the cache. Then one day when he was at the mine, and Catameneda setting snares for quail in the black rock, a thieving prospector rifled it and left them wo[e]fully short of food. Five days of desertness lay between them and any possible base of supplies, and McKenna was not due until the twenty-ninth. They took stock and decided to hold out on short rations until he came. They were very merry about it, being so young, and Catameneda knew the way to piece out their fare with roots and herbs. She promised him he should learn to eat lizards yet, as Indians do. And then suddenly the boy fell sick of a dysentery, which he thought might have come from some mistaken economy of Catameneda's in the matter of canned food. And while he was prostrated with that, came the sand-storm. The girl had sensed it, Indian fashion, days before it came, but he was loggy with weakness and the want of proper care, and let her warning pass. Then came a night of gusty flaws; the morning showed a wall of yellow cloud advancing on them from the south. "I sat up and laid her on the sand. ... It was too much for her ... all she had been through ... bein' so young ... and she had given me all the food and all the water ... though I hadn't felt to know it before. I knew it as soon as I looked at her. ... I reckon she had a hemorrhage or something ... there was blood on her face and sleeves like she wiped it from her mouth." "McKenna came through by noon and we buried her," he finished, simply, "under a pink flowering bush because she loved it. I worked on a ranch in the valley for two years after that. ... I couldn't seem to abide the desert for a spell ... nor the little fires ... but I got over that ... you know how that is." "But I don't suppose anybody knows," he went on, reflectively, "how it is that I don't think of her dead any more, nor any of that hard time we had ... only sometimes when it's spring like this and I smell sage-brush burning ... it reminds me ... of some loving way she had out there ... at Agua Dulce." Note: Illustrations by Denman Fink were included with the original publication of this work. Courtesy of Sarah Brewer Thompson. 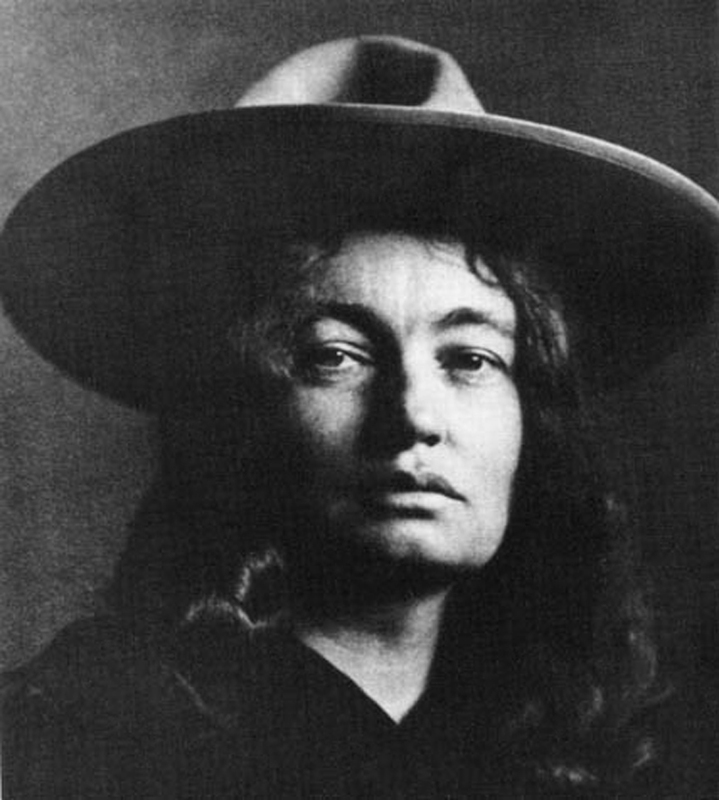 Mary Hunter Austin, ~1900 | Photo by Charles Fletcher Lummis. Mary Hunter Austin (born September 9, 1868 in Carlinville, Illinois; died August 13, 1934 in Santa Fe, New Mexico) was the fourth of six children born to George and Susannah (Graham) Hunter. Austin graduated from Blackburn College in 1888. Her family moved to California in the same year and established a homestead in the San Joaquin Valley. She married Stafford Wallace Austin on May 18, 1891 in Bakersfield, California. He was from Hawaii and a graduate of the University of California, Berkeley. For 17 years, Mary Hunter Austin made a special study of Indian life in the Mojave Desert, and her publications set forth the intimate knowledge she thus acquired. She was a prolific novelist, poet, critic, and playwright, as well as an early feminist, suffragist, and defender of Native American and Spanish-American rights. She is best known for her tribute to the deserts of California, "The Land of Little Rain" (1903). Her play, "The Arrow Maker," dealing with Indian life, was produced at the New Theatre (New York) in 1911, the same year she published a rhapsodic tribute to her acquaintance H.G. Wells as a producer of "informing, vitalizing, indispensable books" in the American Magazine. Mary Hunter Austin wrote about her Independence, Calif., home in "The Land of Little Rain." Austin and her husband were involved in the local California Water Wars, in which the water of Owens Valley was eventually drained to supply Los Angeles. When their battle was lost, he moved to Death Valley, Calif., and she moved to Carmel, Calif. There, she was part of a social circle that included Jack London, Ambrose Bierce and George Sterling and was one of the founders of the Forest Theater. In 1929, while living in New Mexico, Austin co-authored a book with photographer Ansel Adams. Published a year later, the book, "Taos Pueblo," was printed in a limited edition of only 108 copies. It is now quite rare because it included actual photographs made by Adams rather than reproductions. Mount Mary Austin, in the Sierra Nevada, was named in her honor. It is located 8.5 miles west of her longtime home in Independence, Calif. A biography of Austin by Helen McKnight Doyle was published in 1939. References: Hammond, Ann (2002). "Ansel Adams: Devine Performance." New Haven, CT: Yale University Press. "Mount Mary Austin." Geographic Names Information System, U.S. Geological Survey. McKnight Doyle, H. (1939). "Mary Austin: Woman of genius." New York, NY: Gotham House.